Back in the Middle Ages it was the alehouse, unlike the inn, who catered for the local neighbourhood with freshly-brewed ale sold from the ale-wife’s own house. Food was occasionally also available when the ale-wife shared her household meal with strangers. By the late Middle Ages proper established alehouses were becoming more common, selling ‘not only drink on the premises but also probably food’. Over time alehouses gradually became known as public houses but their provision of refreshments to a predominately local clientele continued. In the early modern period ale houses became larger, more respectable, and catered to a more ‘moderately prosperous’ trade. They provided simple food – bread, buns and cheese, pies, or toasted bread and cheese steeped in ale – or customers could also have their own meat cooked and served by the landlord. Industrialisation disrupted this village life as it created large towns, drew labourers away from their village communities into factory labour and created a working-class living in poor housing or boarding-house accommodation. During the late eighteenth century demand for alehouse meals may have increased’ as cities grew and employees had to travel longer distances to work, servants no longer lived in their master’s houses or received food as part of their wages. Journeymen could stop at the public house to eat on the way to work or enjoy a midday meal in the taproom. Mostly this was simply bread and butter and cheese. In the early nineteenth century many poorer people could no longer afford to eat at the public house and landlords refused to cook their food or provide free food for them. Gradually as workers’ wages increased, living standards improved, and time for leisure activities grew, eating out in the public house for recreation replaced the purely func¬tional. Pubs provided simple, affordable, well-cooked food served in pleasant surroundings. The introduction of counters in the early nineteenth century transformed this interior design of public houses and the relationships within them. Now guests were separated from their host by a large barrier and in turn they ceased to be guests and became customers. Having ‘an attractive barmaid was an important asset for the pub and in the late eighteenth and early nineteenth century barmaid became a defined occupation. However, it took a long time before women were permitted to order or drink at the bar. I personally recall at least one Liverpool pub, The Slaughter House, where as late as the mid sixties no female was allowed to cross the white line painted six feet in front of the bar. In 1946 george Orwell wrote an essay the Evening Standard, in which he provided a description of his ideal public house,under the title, the Moon Under Water. Although Orwell’s perfect pub was a fictional one, based on three or more hostelries, the central theme remains. It’s a best kept secret that drunks and rowdies never seem to find, the barmaid calls you dear, the beer is exquisite and served in just the appropriate glass. Fast forward to present day where thousands of jobs are being lost through pub closures. The British Beer & Pub Association (BBPA).say around 1,300 public houses closed across Britain last year, with the loss of 13,000 jobs.
. 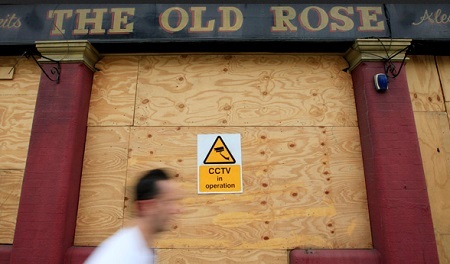 If publicans are to buck this sad state of affairs they must look for new ideas. The decline in sales of beer is nothing new. In the mid 19th century the provision of free snacks from the bar came about when the temperance movement flourished and alcohol consumption declined. At the beginning of the twentieth century the larger breweries with own managed houses, recognised customers were starting to expect more with their beer and began offering free or cheap titbits such as potato or meat pies and cheese and pickles. Pubs survived and the demand grew. Just what is holding the breweries and publicans back now? There are still many hostelries ( i.e. the Sir Richard Steele, in Primrose Hill and the Princess Louise, in High Holborn, in London or the English Lounge, in the northern quarter and Browns Bar in York St, Manchester) who are bucking the trend and drawing customers. Come on. It is time for new innovations. Get your thinking caps on and do not allow the traditional English public house to disappear along with many of our other once loved institutions.